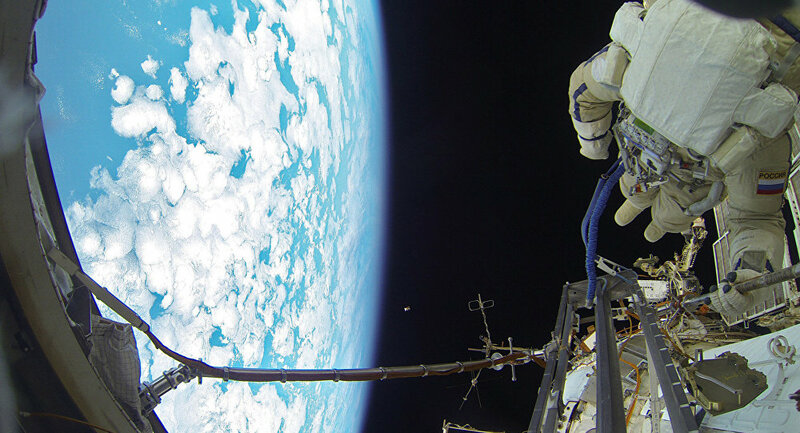 KOROLYOV (Sputnik) - Cosmonauts Alexander Misurkin and Anton Shkaplerov have set a new record for the longest spacewalk conducted by Russians after they were held up in space fixing a communications antenna. The cosmonauts stayed outside the International Space Station for 8 hours 13 minutes, six minutes longer than Oleg Kotov and Sergei Ryazansky, a Sputnik correspondent reported from the Russian space agency Roscosmos' Mission Control Center in Korolyov near Moscow. Misurkin dedicated his spacewalk to the Victory spacesuit art project created by Russian and US cancer patients, Alyona Kuzmenko, the president of the Unity Movement behind it, told Sputnik. "Even if your enemy is a serious disease, even if it is a very powerful and terrible enemy like cancer, don’t be scared and don’t give up! Think only that the truth is on your side – you have a right to live. Fight steadily and you’ll win," Misurkin said in a comment to Sputnik. Kuzmenko said the cosmonaut helped design the logo which adorns the spacesuit. It pictures the Little Prince, a character from a book by French writer and aviator Antoine de Saint-Exupery. The suit was launched to the ISS in October 2017. However, the world record belongs to NASA astronauts Susan Helms and James Voss, who conducted an 8-hour and 56 minute spacewalk in 2001.